Sydney Harbour glistens and shines and is the centre piece of all that is great about this city. There are beautiful bays, cliff tops and headlands, yatchs and of course the Harbour Bridge and Opera House. One great aspect of the Harbour is the ease of getting around so why not hire a water taxi and cruise to some breath taking photo locations on your wedding day? 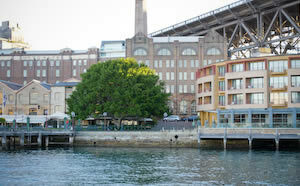 We detail below a number of Sydney Harbour photo locations. Bradley's Head is a wonderful outdoor wedding location, right on the Harbour and with stunning panoramic views of Sydney city. The best spot is in a sheltered grass area next to the HMS Sydney with a long stone jetty. Photo locations are very convenient, and the functions centres of Taronga Zoo and Atholl House are nice and close by. 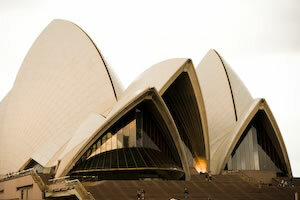 The Sydney Opera House is an icon of Sydney and can make for a great backdrop for your wedding photos. The Opera House steps are lovely, but this area can be busy on weekends. Generally people will move away from an area if you ask nicely. Get up close for some interesting shots with the Opera House, and use it as a feature in the back ground for photos from around the Rocks area. Dawes Point Park is right at the end of the Rocks, underneath the Harbour Bridge and so it has a number of views towards the Opera House, Luna Park, and the Harbour. Quite a popular place for shots looking up the Harbour Bridge, but is usually very shady in the afternoon.